Guizzardi, R.; Franch, X.; Guizzardi, G.; Wieringa, R.
Proceedings of the 6th International i* Workshop 2013. Valencia, Spain, June 17-18, 2013. In the past few years, the community that develops i* has become aware of the problem of having so many variants, since it makes it difficult for newcomers to learn how to use the language and even to experts to efficiently exchange knowledge and disseminate their proposals. Moreover, this problem also delays the transfer of the i* framework to industrial settings. Our work is one of the current attempts to promote interoperability among the existing variants, and it does that by investigating the semantics behind the i* core concepts. For that, we apply a foundational ontology named UFO, which is used as a semantically coherent reference model to which the language should be isomorphic. In this paper, we report on the steps we have pursued, what we have accomplished so far, also setting the context for the work ahead. In the past few years, the community that develops i* has become aware of the problem of having so many variants, since it makes it difficult for newcomers to learn how to use the language and even to experts to efficiently exchange knowledge and disseminate their proposals. Moreover, this problem also delays the transfer of the i* framework to industrial settings. Our work is one of the current attempts to promote interoperability among the existing variants, and it does that by investigating the semantics behind the i* core concepts. For that, we apply a foundational ontology named UFO, which is used as a semantically coherent reference model to which the language should be isomorphic. In this paper, we report on the steps we have pursued, what we have accomplished so far, also setting the context for the work ahead. Guizzardi, R. [et al.]. 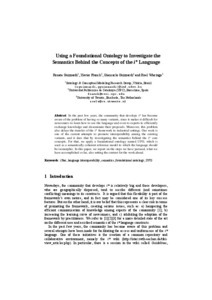 Using a foundational ontology to investigate the semantics behind the concepts of the i* language. A: International i* Workshop. "Proceedings of the 6th International i* Workshop 2013. Valencia, Spain, June 17-18, 2013.". Valencia: 2013, p. 13-18.